In January 2012, 10-year-old Izaac caught a cold. After having a fever and a brutal cough for two months that had been treated with antibiotics and nebulizer treatments, we decided to do a CT scan of his throat. This scan showed nothing and every test under the sun was run from HIV to meningitis. All negative. Izaac suffered with the same cough and fever for two more months missing most of the school year, so we started over and went in for a “Well-Child” checkup. Everyone could see that he was not well, but he was growing super tall and had started to hit puberty. Finally, a blood test revealed elevated sodium and our pediatrician suspected a brain tumor. The next morning Izaac went in for an MRI and a mass was revealed that was attached to his hypothalamus. By the next morning we would be flown from Steamboat Springs to Children’s Hospital Colorado because his high level of sodium was too risky for travel by car. The word mass didn’t equate to cancer until an EMT asked if we had spoken to the oncologists yet. After arrival, Izaac was taken into surgery for a biopsy to determine what his tumor contained. At this time, he was so sick he was unable to speak coherently, nor could he feed himself. On May 14, 2012, it was determined that Izaac had a nongerminomatous germ cell tumor. Surgical removal in that area of the brain is too risky, so chemotherapy was the only option. The most difficult thing to watch was nurses coming in with what seemed like hazmat suits on to administer chemo directly into a port in my child’s chest. Remarkably, this poison that was killing the cancer helped so much that Izaac actually felt better than before he had the chemo. For those six rounds, we visited the zoo many times, the museum, and had our first introduction to The Morgan Adams Foundation during their Motorized Madness event at Children’s Colorado. What a blast we had racing cars around the hospital parking lot at crazy speeds, giggling the entire time. Then we were able to attend the Morgan Adams Concours and Izaac was treated like royalty! 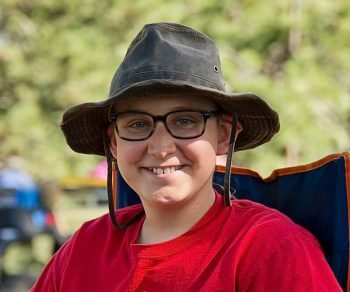 After chemo, Izaac had 31 days of radiation. He struggled with exhaustion during this time but was able to walk to radiation each day and always kept his “positivity” at a high, blaring the Rolling Stones while in the radiation tube. We left Denver returning to Steamboat with Izaac and ready to resume our lives as they were before. In February 2013, Izaac’s scans were clear! Only a small spot remained that would likely be the benign portion of his tumor. Our lives went back to as normal as they can be after your child is diagnosed with brain cancer. “It” never leaves your mind but you long for forgetting. Izaac went back to school, 5th grade, attending half days at first then moving into full days. He was so excited to be back in the swing of it all and even went skiing multiple times to show what resilience really is! Then on May 14, 2013, Izaac’s school nurse called saying he had a headache and wanted to go home. I kept myself calm. Although he had not once had a headache with his tumor, anytime you hear those words after your kiddo has had brain cancer you instantly go into a panic. Within minutes of arriving at home, I made the call to our team at CCBD. Jenny had me on the phone when Izaac started to vomit. I knew something was wrong, but I was able to stabilize him and have him rest. I started wondering, “Is this the flu or is something really wrong?” Of course, he had a fever, but that was also the sign of his tumor/alien. We left for Denver and the MRI at 2 am. We had breakfast and went to the hospital. Izaac was again sick while in the machine and I went in to help cleanup, glancing at the screen as I walked by. There it was, the alien was there on the screen. I convinced myself that it was an old image and that they were comparing his current scan to the new scan. That was not the case, in just three months his tumor had completely grown back to its original size. Joan was the first person I texted to let her know that Izaac had relapsed. Her simple words of support have never been forgotten. the out of the box thinking is what saved this kid! After six weeks of oral chemo, we were told to stop taking it as it could cause a secondary cancer. For the next three months we waited until we could scan again to see if this pathway had worked. Amazingly, the alien was no longer there! Today Izaac is vibrantly healthy! He does have many difficulties from the tumor and from the harsh treatment his body had to endure to get rid of the alien. The good news is that he has had stable scans for almost five years and will be off treatment for five years on 12/30/18! 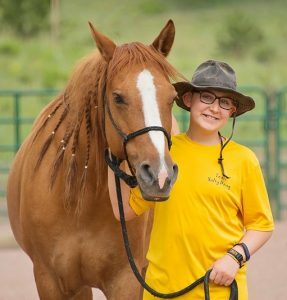 Things are different today than they might have been, but we are beyond grateful for what MAF and Children’s Colorado have accomplished for Izaac.